In Part One of this article, we looked back to the origins of Filmation, an animation studio founded in the early 1960s by artist Lou Scheimer and former Disney artist Hal Sutherland; they were later joined by radio announcer Norm Prescott. Generation X’ers grew up on their cartoons and still remember them fondly. It is only now, with the release of many of their shows on DVD, that the studio can again be appreciated by modern audiences. They made their early success on the strength of popular licensed properties, as described in Part One, but also enjoyed acclaim with some original shows. In the second part of this article, we will now look at their continued reliance on licensing, even as they branched out further into original programming and live action before ultimately folding due to various factors. Although Filmation had lost ABC as a client, CBS still had plenty of the studio’s product in 1976. Tarzan, Lord Of The Jungle marked a return to animated adventure for Filmation when it began airing that year. The Lord Of The Jungle’s design was patterned after the newspaper strip version, and his movements were often rotoscoped (i.e. animation was done over live action footage) for increased realism and quicker animating. Meanwhile, another classic hero returned. The New Adventures Of Batman saw Gotham’s caped crusader back at Filmation, once again combating his classic foes alongside Robin and Batgirl, and this time joined by the imp Bat-Mite. 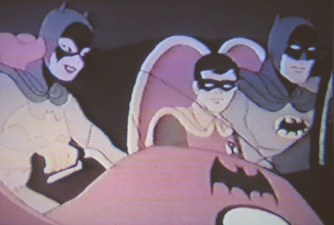 In a neat switch, the 1960s Batman and Robin voice actors were at this time voicing the same characters on Hanna-Barbera’s Super Friends, so Filmation recruited Adam West and Burt Ward to reprise their roles from the live action show. Ark II was also on CBS in 1976; it was a live action show that portrayed the efforts of a small group of scientists attempting to give mankind another chance after a world holocaust. After a long production delay Journey Back To Oz finally went to theaters in 1974, and then aired as a 2-hour prime time special in December 1976. The TV version added new live action segments with Bill Cosby. The movie had the voice of Liza Minnelli as Dorothy, reprising her mother’s role from the MGM classic motion picture. 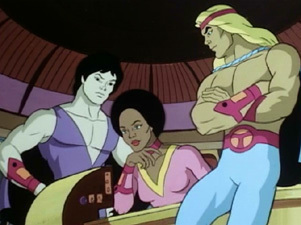 The Young Sentinels was shown on NBC in 1977, and featured three racially-diverse youths who had been given superpowers by an alien computerized being. The show failed to click with viewers, and was re-christened as Space Sentinels before being cancelled. Sci-fi genre veteran Jonathon Harris starred in the live action Space Academy on CBS in 1977. The tale of a planetoid that housed an academy for eager young space cadets was an impressive but expensive endeavor, with miniatures and other special effects, and it was spun off into a different format the following year. In retrospect, it looks like this show may have been inspired by the similar effects work in Star Wars, but of course the show was sold to the network before Star Wars was in theaters. The Batman-Tarzan Adventure Hour combined the two shows into one package in 1977. 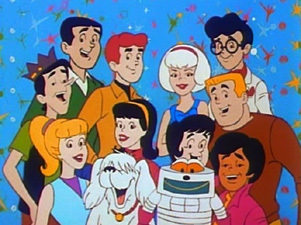 The Archie shows were off of CBS, but syndicated packages of the shows were still very successful. This inspired Silverman, who was now at NBC, to order The New Archie /Sabrina Hour for NBC in 1977. Ratings were low, however, and the show was split in November into The Bang Shang Lollapalooza Show Starring Archie And His Gang and The Superwitch Show. The Fabulous Funnies saw Filmation returning to the funny pages for a new NBC series in 1978. This show included Broom Hilda, Alley Oop, The Katzenjammer Kids, Nancy, and a single appearance by Tumbleweeds (for which Filmation had not realized they had not secured the rights). Tarzan And The Super 7 was the next starring vehicle for Tarzan in 1978, where he got eight more new episodes and headlined a ninety-minute program that also had segments for such adventure series as Web Woman, Manta And Moray, Superstretch And Microwoman, Freedom Force (including an animated Isis, and Hercules from Space Sentinels), and the next series mentioned below. 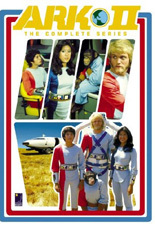 Jason Of Star Command was the aforementioned spin-off of Space Academy. It still utilized impressive special effects, and it expanded the scope of the stories compared to the prior incarnation. Jason had serialized episodes which ran just 15 minutes as part of in Tarzan And The Super 7. The cast addition of James Doohan of Star Trek fame helped garner attention. In 1979, it was expanded to its own half-hour, and it received twelve new episodes. 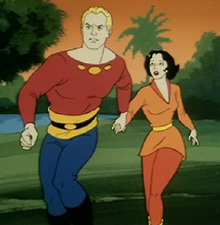 Filmation saw one of its finest shows debut in 1979’s The New Adventures Of Flash Gordon. The series was quite faithful to the original Alex Raymond comic strip story, and the quality of design and animation (some rotoscoped from live action footage) was some of the best ever seen from the studio. Flash had enough prestige to premiere as a two-hour primetime movie. It was in production at the same time as Dino De Laurentis’ live action version, and the director volunteered to invest in the animated production when it ran into money problems. Flash, unfortunately, did not fare well in the ratings, but NBC gave it another chance the following season. Changes had to be made, however, and the scripts went away from the style of an ongoing serial to individual twelve-minute stories. The scripts were also made less serious with the addition of a pet baby dragon named Gremlin. The gambit failed, and the series was cancelled after its second season. 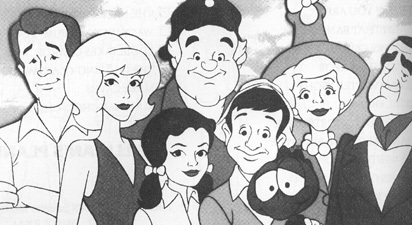 The New Fat Albert Show brought new episodes to the long-running show in 1979. It was here that the kids started watching clumsy superhero the Brown Hornet on TV, and his adventures helped to illuminate the solution to whatever problem was being dealt with that week. In 1985, Fat Albert went into syndication with 50 new episodes, with a new The Legal Eagle segment alternating with The Brown Hornet. CBS owned the rights to the Terrytoons characters in 1979, and they commissioned Filmation to create The New Adventures Of Mighty Mouse (And Heckle And Jeckle). Segments featuring Filmation’s own Quackula joined the classic characters. A Snow White Christmas Special was a one-hour 1980 show done for CBS. Contrary to tradition, Snow was joined by seven giants to fight an evil queen and save Christmas. In 1980, MGM took Bill Hanna and Joe Barbera’s famous cat and mouse duo and handed them over to Hanna-Barbera’s rival Filmation, resulting in The New Adventures Of Tom And Jerry. The CBS series featured two Tom And Jerry segments, along with a new Droopy cartoon. Producer Lou Scheimer had to voice Droopy for some of the shows, since the Screen Actors Guild strike left Filmation without the services of Frank Welker. With Tarzan a solid success for Filmation, they added another classic hero to his show to create The Tarzan/Lone Ranger Adventure Hour. The Lone Ranger had actually had a cartoon back in 1966, and Filmation had had him appear on an episode of The Brady Kids in 1972. The 1980 version would include numerous historical figures, adding an educational context to the show. Because network standards for violence had changed much since the 1966 show, the Ranger would have to use his gun only for trick shots. Sport Billy was actually originally produced for a German company and was based on that company’s mascot. Sport Billy traveled through time to thwart an evil Queen from ruining sports through the ages. Produced in 1981, it was shown in Europe in 1982, but the show ended up being shown on NBC in 1984 as a mid-season replacement. The Tarzan, Lone Ranger, Zorro Adventure Hour brought Zorro into the mix with the Masked Lawman and the Lord Of The Apes in 1981. 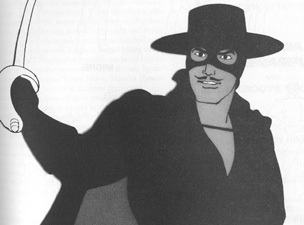 Zorro was notable for its all-Hispanic cast and rotoscoped swordfights. According to the book Animation By Filmation, it was also notable for leading to the studio’s closure! Previously, Lou Scheimer has stubbornly refused to ship any of Filmation’s work to overseas studios, as he wanted to keep his productions fully domestic. In 1981, however, Filmation found itself overwhelmed by the demands of several series, and Scheimer allowed work on Zorro to be sent to Japan. Filmation found the situation too difficult, and decided to stick to the old policy, but the result of the Japanese studio’s effort was a beautifully animated series that proved that Japanese animation houses could compete with the American studios and for relatively cheap production costs. This helped to lead to the other American studios ramping up foreign country-assisted production, and lowering their fees below what Filmation’s were. 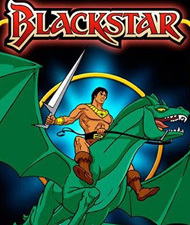 Blackstar was also on CBS that year, joining the fantasy bandwagon made attractive by the success of the impressive Thundarr The Barbarian series from Ruby-Spears a year earlier. It combined aspects of Flash Gordon and Lord Of The Rings by featuring a lost astronaut on an alien world battling the forces of an evil sorcerer. Originally conceived as a black character with scary-looking comrades, the designs were changed to be considerably more acceptable to conservative American audiences. It lasted just one season, but made an impression on the folks at Mattel, who were shopping for a production house for a new series of characters… The fruition of this idea would lead to Filmation’s greatest success yet. Before that, though, The Kid Super Power Hour With Shazam! 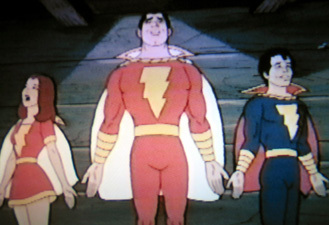 brought Captain Marvel back in 1981, this time in animated Shazam! segments which were much more faithful to the comic book than the live action series had ever been. 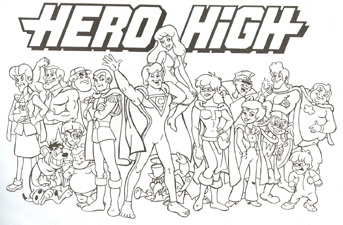 The other segments included a live action teenage band wearing superhero costumes, and animated versions of the same teens attending Hero High. The original concept was to bring to animation the superhero alter egos of the Archie characters (Pureheart The Powerful, et. al. ), with the characters being modeled after the same personality types as the Archie gang. Gilligan’s Planet saw one of the loopiest premises for a Filmation show premiere in 1982. CBS decided to get some more mileage out of the franchise by allowing Gilligan and company to escape their island, only to wind up stranded on another planet altogether. Dawn Wells joined the rest of the original cast this time, and she voiced Ginger (still blonde) in addition to Mary Ann. 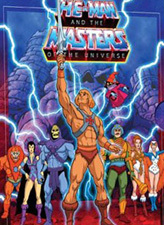 Mattel had liked the look of Blackstar, and chose Filmation to produce He-Man And The Masters Of The Universe for syndication in 1983. It was amazingly fortunate, since by now each of the networks had chosen to never order another series from Filmation again due to declining ratings and other factors. He-Man was an innovator as far as both television and toys were concerned. The show got an order for 65 episodes to be shown daily in weekday afternoon syndication, and was the first show to take advantage of new FCC rules which allowed TV shows based on toys (so long as no ads for the toys appeared during the show). The cartoon and the toy line, featuring the fantastical adventures of He-Man and his friends fighting the evil Skeletor in Eternia, were each a huge success and saw 130 new cartoon episodes made over three years. There was an explosion in animation and action figure lines after that, with the He-Man-related toy lines grossing over two billion dollars over three years, and the television and toy store landscapes have never been the same since. She-Ra, Princess Of Power was He-Man’s twin sister Adora, designed to appeal to girls who were found to be surprisingly interested in the Masters Of The Universe toy line. 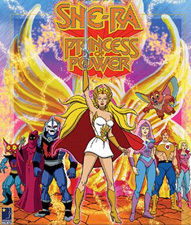 Her show began in syndication in the fall of 1985 with 65 shows, showing She-Ra’s discovering of her heritage and battling the evil Hordak in Etheria. Unfortunately, the toy line had disappointing sales, and only 14 more episodes were produced after the initial order before the series ended. 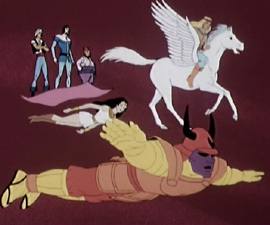 He-Man and She-Ra did appear in a Christmas special together as well. Ghost Busters took the old live action show and turned it into an animated cartoon in 1986, following the popularity of the unrelated 1984 Bill Murray movie of the same name. This time, the show had the sons of the original ghostbusters teamed with the same gorilla, TV news reporter Jessica, and the time-displaced Futura fighting against Prime Evil and his fellow troublesome ghosts. It was produced for syndication, with co-owner Tribune Broadcasting. The first year of the show received good ratings, but was soon to be displaced by a cartoon from DiC that was based on the Columbia Ghostbusters film, annoyingly titled The Real Ghostbusters. Filmation had one more syndicated series to come before the studio folded. Bravestarr was essentially a Western set in space. It had the backing of Mattel, to whom Filmation had brought the show while looking for a production partner. The toy line came out in time for Christmas 1986, but was gathering dust before the show debuted several months later. A movie called Bravestarr the Legend, featuring an “origin” story, was produced for Christmastime 1987 but was never released. Poor toy sales and low ratings meant the end of Bravestarr, as well as the end of Filmation. After cosmetics manufacturer L’Oreal bought the studio from Westinghouse in 1987, they promptly closed it in 1988 (perhaps for tax reasons). There were two theatrical movies to yet be released from Filmation under a special “Classics” unit at the studio, produced for a total of ten million dollars. Most of that budget went to Pinocchio And The Emperor Of The Night, which came out on Christmas Day 1987. It faired poorly. It would be a while, though, before the public would finally see the final Filmation production. Happily Ever After (originally titled Snow White And The Seven Dwarfelles) was being produced over the years 1986 and 1987, but did not see its release until another company bought the rights to it and put it into theaters in 1993 (one source says a release was also tried in 1990). Most people consider this movie relatively dreadful, partially due to the meager budget left over after Pinocchio, although I have never seen it myself. In the end, Filmation will be remembered for its positives as well as its minuses. This is one studio that deserves (and is now getting) another look, since many who bad-mouth it either have not seen these shows for themselves, or cannot really remember what they viewed in their youth. Fortunately, the new DVD sets coming out— primarily from BCI— are allowing both old and new fans to see the shows today and find out just how entertaining they can be. It is true that they re-used animation and employed rotoscoping, and these factors plus the limited animation meant their shows often looked cheaply done. However, many of their shows were actually quite handsome despite their limitations. They had a diverse array of product that often featured perennially popular characters from other media, in stories with a strong moral center. They also tended to avoid excessive violence, and the producers managed to keep production at home in the United States, with the exception of Zorro. Regardless, for those of us that grew up during their heyday, Filmation provided countless hours of entertainment. 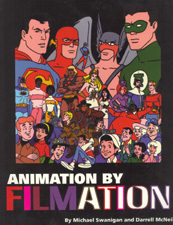 In March 2004, the rights to many of the Filmation shows (not including many of their licensed properties) were bought from Hallmark (who had done little with them) by Entertainment Rights. They had big plans regarding home video releases, and those plans are seeing fruition today, chiefly with BCI. The licensed shows are also getting some exposure again, such as with Archie Comic’s DVD releases and Paramount’s Star Trek, with hopefully more shows to follow! Like many, I’ll be staying tooned for further announcements. This article could not have been possible without the use of the marvelous book Animation By Filmation, by former Filmation employees Michael Swanigan and Darrell McNeil. What it lacks in proofreading it makes up for with content. Every series is discussed, with complete episode titles and usually production artwork. It does skip over some specials and movies, however.